Few of fashion's many portmanteaus elicit the full-on eye-roll that "athleisure" does. But before you write off this not-so-passing trend, why not appreciate this free pass to constant comfort? Here's how to score style points at the intersection of streetwear and sportswear. 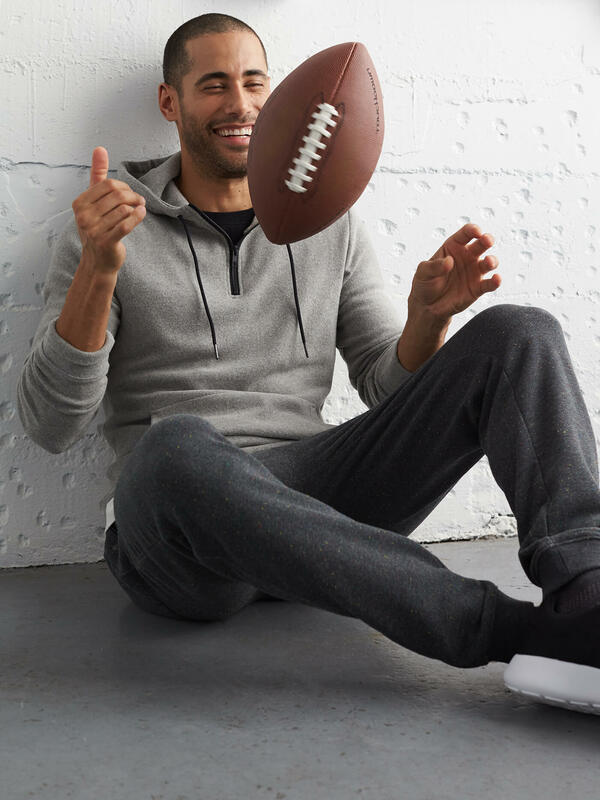 Read on to learn more about the athleisure trend for men. Men can thank women for breaking the seal on wearing sweatpants in public. As yoga exploded, eponymous yoga pants could be seen everywhere. But those Lycra-clad ladies were onto something: not only was it convenient to hop right from a daily commute to a yoga mat, it was hella comfy. Shoes play a paramount role in completing the athleisure uniform. A well-chosen pair of kicks acts like punctuation to your wardrobe—and it’s up to you if you want to use a period (like canvas low-tops) or an exclamation point (Day-Glo sneakers). Today’s sneakerheads have a wide range of options, but the sky’s the limit when it comes to your feet. Feel free to play with a variety of textures and colors. And remember: sneakers can be worn with just about anything. Streetwear sweatpants were probably foreshadowed by the cozy boy movement—and now they’re a staple of the athleisure look. But we’re not talking the $5 heather grey sweats you rocked in fourth grade. We’re not talking the $5 heather grey sweats you rocked in fourth grade. Get tapered or slim-fit joggers to ensure you don’t look like Aladdin. You want something that fits comfortably around your lower leg without looking baggy. Different brands fit differently, so ask your Stylist to experiment with a few. Like that perfect pair of jeans in your closet, it might take a few tries before you find the pair that works for you. Get tapered or slim-fit joggers to ensure you don’t look like Aladdin. Think beyond the lumpy hooded sweatshirt of Rocky Balboa. Athleisure styles tend to emphasize the body with fitted silhouettes. This means a mix of slim-cut sweatshirts, fleece pullovers and technical shirts made from light, breathable fabrics. These shirts are generally made with high-tech synthetics to keep you cool and wick away sweat without making you look like Hiking Dad. Layers add complexity to your look. Pair a fitted sweatshirt with a stylish track jacket or bomber. For a more fashion-forward look, toss a long coat or leather jacket over a fleece crew. Athleisure is more forgiving when you mix styles, as long as the individual pieces don’t clamor for too much attention amongst themselves. It’s all about balance. Instead of pairing joggers with a basic tee (which makes you actually look gym bound), wear them with a button-up shirt (unbuttoned at the collar) or a slim-fitting cotton sweatshirt. Or wear your colorful Flyknit runners with an understated cardigan to balance out the look. Athleisure is more sport than science, which means there’s no formula for the perfect look. As long as you’re comfortable—without looking like you just rolled out of bed—you’re on the right track. Find a few statement pieces to incorporate with your existing wardrobe to make a style all your own. Athleisure is more sport than science, which means there’s no formula for the perfect look. Our Stylists are here to sweat the small stuff, so you don’t have to. (Don’t move a finger, bro; you’re way too comfortable.) Ask for athleisure in your next Fix.